This month’s display of books from the Biography Collection at Kensington Central Library showcases musicians with significant anniversaries in 2018. 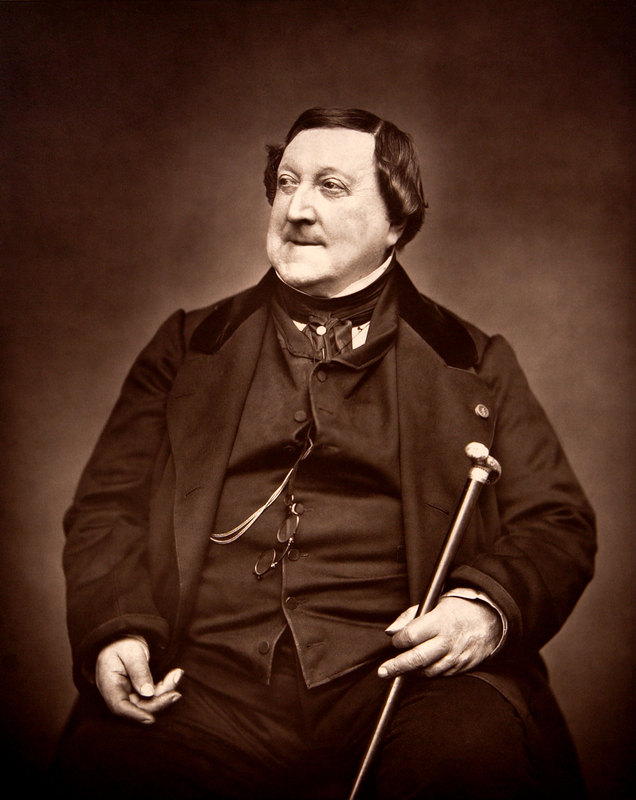 Those we have most books on in the collection are Leonard Bernstein (born 1918), Claude Debussy (died 1918), and Gioachino Rossini (died 1868), but we include many others. This event is free, no need to book – just turn up. 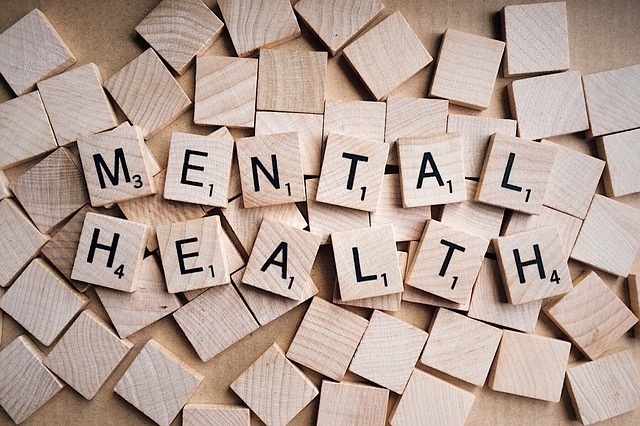 One way to break cycles of unhelpful thoughts and behaviours is cognitive behavioural therapy and in the West London Clinical Commissioning Group area there is Time to Talk, a free psychological therapy service. The Reading Well Books on Prescription initiative is part of our Bibliotherapy offer. Our libraries host read aloud groups in partnership with The Reader Organisation. 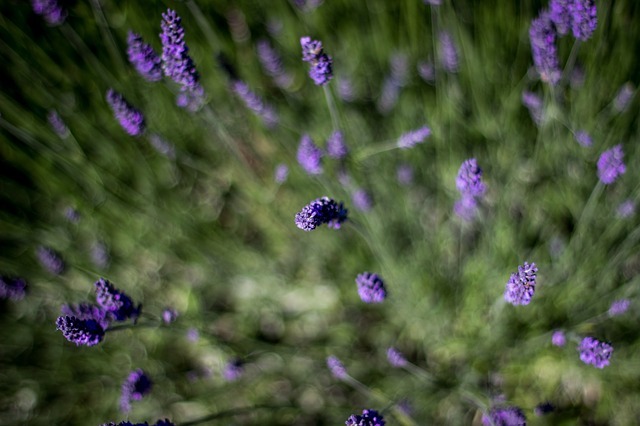 These facilitator led Book Break groups meet every week and give members the opportunity to join in reading aloud from good literature and discuss what has been read over a cup of tea or coffee or just sit back, listen and enjoy the company. There are also some very good enjoyable fiction books available free to borrow hard copy or online! See our new book displays or see what eBooks and eMagazines we have. Did you know that reading for as little as six minutes can improve mental well-being? New Arrival – Naxos Music Library! Naxos Music Library (NML) is now available for RBKC library members! With an unparalleled depth of classical music content, extensive background information, and improved search facilities that remain simple and effective, NML is a pleasure to use regardless of your prior music and/or technical knowledge. Your library membership is access to a world of information. We are encouraging you to get the most from your local libraries, by making use of our great range of free online learning courses. Getting access to quality training materials can be expensive – but you can get them for free from us and once registered, you can have access to these materials whenever and wherever you want. Let me introduce you to Learning Nexus, Universal Class, Go Citizen, and Driving Theory Test Pro! So this year Her Majesty Queen Elizabeth II celebrates her 90th birthday. Or rather birthdays, as while her actual birthday is today, 21 April (she was born at 17 Bruton Street at 2.40am on 21 April 1926), her formal birthday with all the pomp and ceremony is on the second Saturday in June. This year there will be a weekend of celebrations, such as the Patron’s lunch on Sunday 12 June. But as the title says – what was said and what happened on the day itself? Using our newspaper archives , both online and hard copy, it is possible to have a glimpse of the news as it would have been read by the people of 1926. First of all, the time of the then Princess Elizabeth’s birth was important for the daily newspapers. Normally an event which occurred on the 21st would be reported on the 22nd once it has had a chance to be written and printed. However, because the event took place so early in the morning it made it into the headlines of the day! Check the Times Digital Archive to see how the news was reported (log in with your library card number). You could limit your searches to just 21 and 22 April, or simply browse through each day’s newspaper. Then take a look at some of the other papers – different publications can give you different types of story and varying headlines. Think about your search terms; which words will you use? Try out different ones. Remember that the baby born that day had not yet been named, was not yet Queen or even the heir to the throne. Here are a few tips for possible keywords: granddaughter, daughter, birth, Duchess of York, and royal are just a few. From my searches I discovered that The Times managed to get an announcement into its 21 April ‘News in Brief’ section, and the next day mentions that the princess is third in line for succession to the throne (an important fact, as we would find out later on). And take a look at our Illustrated London News collection for some images too. These are available in Central and Chelsea Libraries. Lots of stories to explore! Why not go further and see what is written about each of the birthdays and life events over her 90 years? You can read more in one of the many books featured on our catalogue, and find dates and events to then research in the newspapers. Be imaginative with your search terms; you never know what you might discover! Did you know this week is science week? And in honour of Science Week Britannica Online have created a special microsite to celebrate some of the scientists who have made remarkable inventions and discoveries, leading to major advances in the field of science. You will find links to articles about a variety of people who have made contributions to the scientific community. These articles will help you complete the quiz, word search and crossword. Britannica Online have also created a diagram that shows well known scientific fields and their notable scientists; many scientists fall into more than one field! Take a look and try the quiz! You’ll also find lesson plans, activities, biographies and other media to entertain and inform. OK so how can a dictionary be exciting? you may ask. I thought the same thing as I was about to explain to two youngsters doing their work experience here in Kensington Central Library. Well, it is easier than you think. The Oxford English Dictionary shows you just how diverse our language is. It isn’t just a language derived from a single origin but a number of origins – Greek, Latin, French, Arabic, German, Japanese, and more… It shows each word’s history by telling of the origins of words, their first use, their reasons for meaning what they do as well as just what they mean now and other words which can be used in their stead. I also enjoy the fact that, when you are told that you have spelt a word wrong- perhaps spelling it as it sounds- it is perhaps we ourselves who are a bit silly trying to enforce spelling, as words have developed their spelling over a great many years. Indeed, a word’s spelling is simply a way of making it understood verbally, not as the modern age suggests, which is a rule which we must follow to the letter! In the library you will be signed in automatically and from outside you will just need to type in your Kensington and Chelsea library card number. Please ask a member of staff if you need any help, and we will be happy to give you a hand! 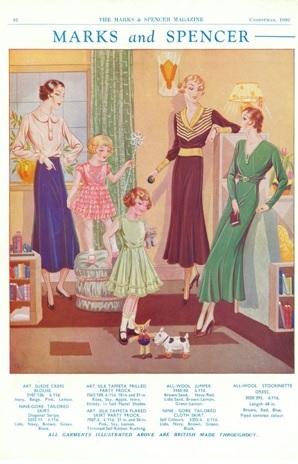 Recently, Rachel Worth, Professor of Dress and Fashion at Arts University Bournemouth, delivered a presentation on the history of Marks & Spencer at Chelsea Library. This post is based on what we learnt about the high street giant from Rachel’s fascinating and insightful lecture. From very humble beginnings in a Penny Bazaar stall at Leeds Kirkgate Market in 1884, Michael Marks and – from a partnership that began in 1894 – Thomas Spencer together built a company that would become Britain’ s biggest clothing retailer. Today, Marks & Spencer is a company synonymous with quality, reliability and customer care, but do we associate it with fashion? Well – yes! 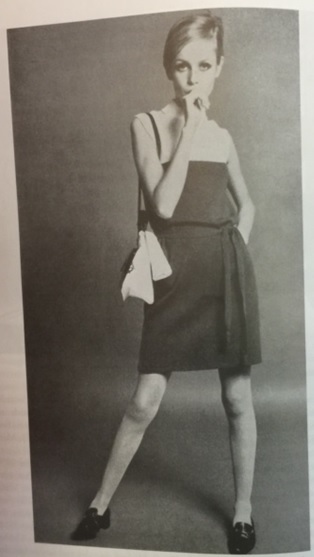 Marks & Spencer was at the forefront of bringing accessible and fashionable clothing to the masses, at the same time being a pioneer in using new textiles, displays techniques and marketing methods – including the use of “supermodels” before the word was ever invented. In the 1890s most working class people made their own clothes, and initially the market stall sold haberdashery (dressmaking materials). The sales slogan of “Don’t Ask The Price, It’s A Penny” summed up the business model. By the outbreak of World War One the company had expanded considerably and had diversified into homewares, but clothing remained at the heart of the business. 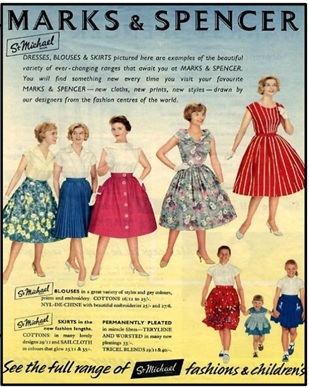 Marks & Spencer revolutionised how we bought clothes and also how clothes were sold, focusing on ready-to-wear affordable goods; high quality, well designed and fashionable clothing. In the 1920s M&S was ahead of most other retailers in its marketing and retailing methods setting an upper price limit on clothes. It also accepted the return of unwanted items, giving a full cash refund if the receipt was shown, no matter how long ago the product was purchased, which was unusual for the time. It entered into long term relationships with British manufacturers, and sold clothes of the “St Michael” brand, introduced in 1928. 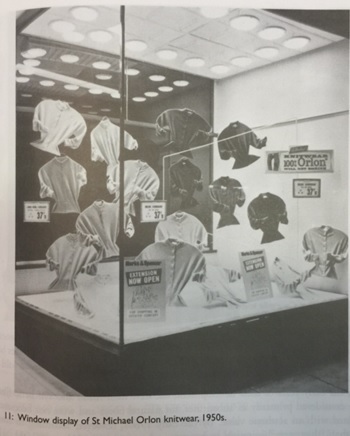 As the company dealt directly with manufacturers it was able to keep prices low and to maintain input in the design and quality of clothes sold in its stores. It was one of the first companies to introduce standardisation in sizing. It also aimed to cater for all members of the family; children’s clothing and ready-to-wear suits being particularly popular. Pioneering methods included having its own textile laboratory to enable the testing of fabrics and dyes before mass production, and the use of rainmaking machines to test water repellent fabrics. 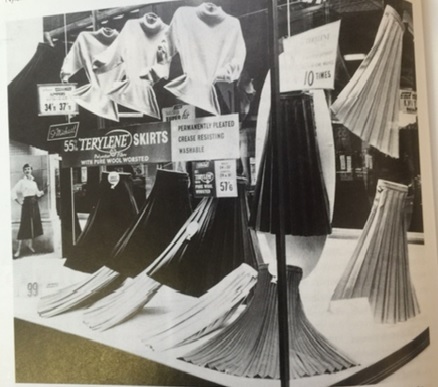 New synthetic textiles were particularly popular between the 1950s and 1970s. These included Tricell which was first used in 1957. Another synthetic fibre called Courtelle was first launched, nationally, by Marks & Spencer during the 60s as was Crimplene and Terylene. These fabrics were easy to wash, often drip dry, easy iron and held their colour or shape. 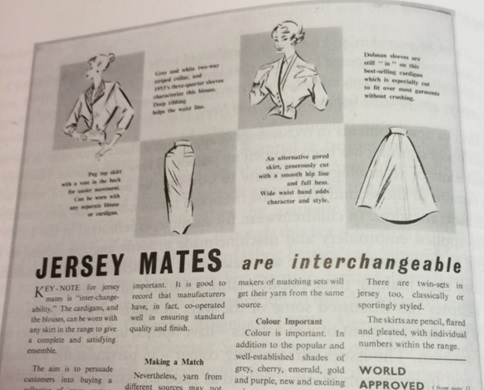 Terylene, for instance, meant the fashionable 50’s woman could have a permanently pleated non-iron skirt. 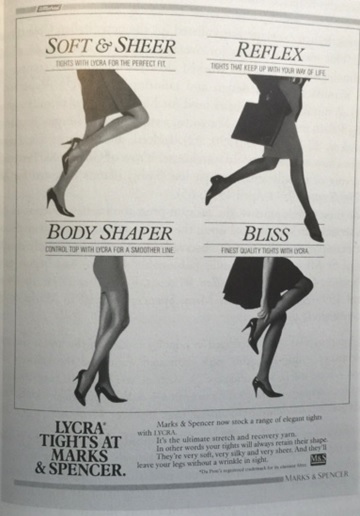 The introduction of Lycra in the 1980s revolutionised hosiery, swimwear and underwear because of its elastic properties. Marks and Spencer has always been design conscious, and no more so than in the 1950s when designs were Paris-inspired with an interpretation of the New Look being all the rage. Colour coordinated clothing and jersey knitwear enabled the fashionable women on a budget to change her look , updating key pieces when on a tight budget. If fashion is a concept based around our attitudes to clothing then Marks and Spencer is part of its fabric: with its high quality/ good value ethos, innovative and strong relationships with customers, and its technological innovations it led the way in fashion for the masses. Our thanks to Rachel for revealing some of the secrets to the success of the company over the last hundred years. Rachel’s book, Fashion for the People: a history of clothing at Marks & Spencer is available to read at Chelsea Reference library. 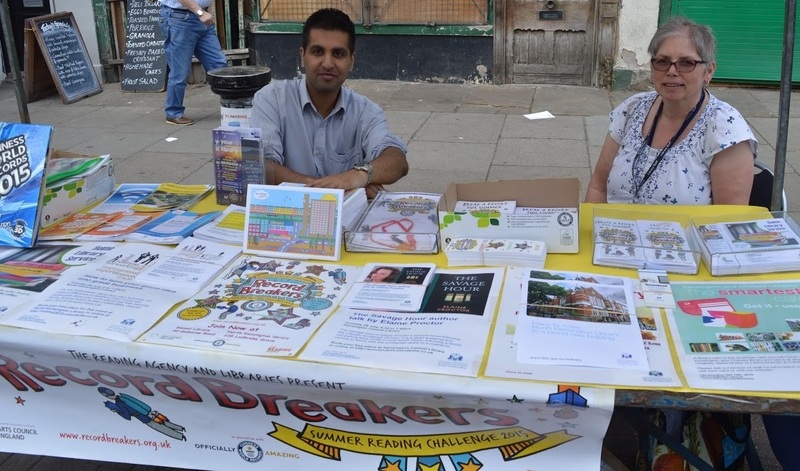 On Sunday 19 July, Sandeep, Margaret, Natasha, Leanne , Nina and myself manned a market stall at the Golborne Street Festival. The day did not begin well: rain and extreme wind made setting up the stall with bunting and posters very interesting! By the time the festival started, however, the sun had broken out and we were taking shelter under the stall canopy. We took turns to staff the stall and leaflet the crowds. 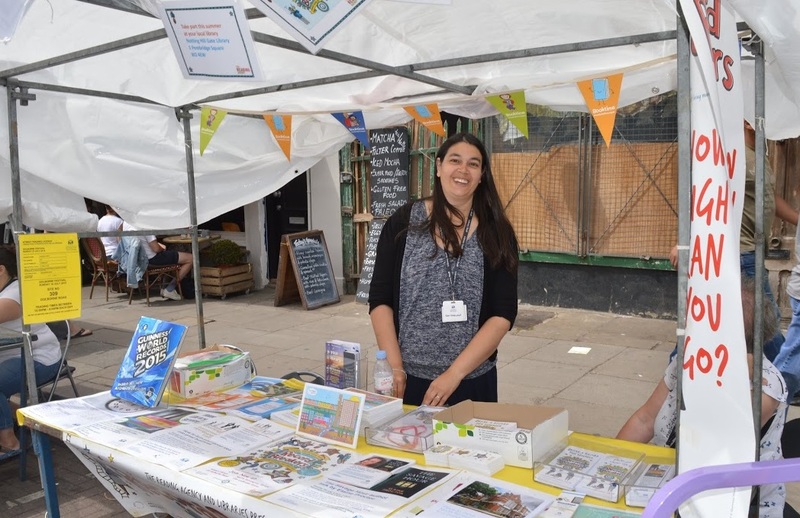 There was a fantastic atmosphere with representatives from a variety of organisations and community groups, food and craft stalls, plus the obligatory bouncy castle, face painting and live music. For us it was a unique opportunity to reach a wide cross-section of the community we don’t normally see in the library and tell them about all the resources, activities and services libraries have to offer. Lots of people did not realise that the library service is not just about books; they were pleased and interested to hear about Zinio, Universal Class, e-books and events. Nina completely exploded the myth of the traditional reference librarian by dancing down the street and completely raiding the police and food stalls. She ran a gang of street urchins (also known as her friend’s children), whom she bribed to help us distribute Summer Reading Challenge leaflets. 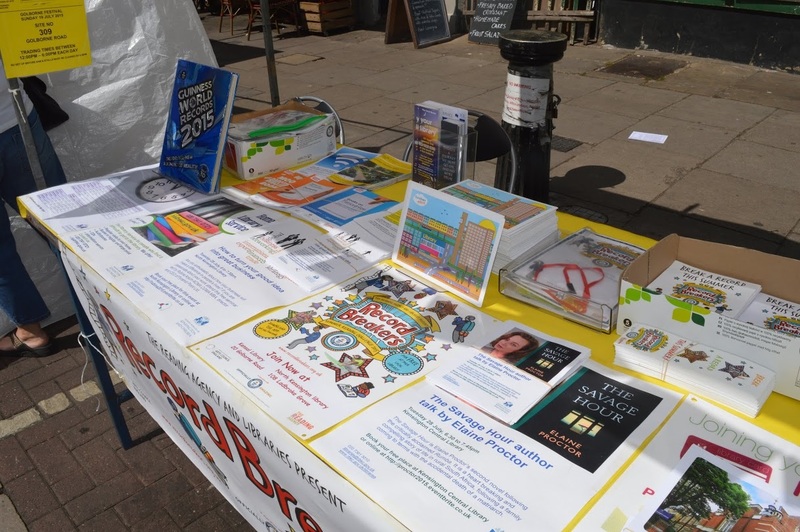 We had a great day, distributing more than 200 Summer Reading Challenge leaflets and, over the course of the day, spoke to many hundreds of adults and children about our wonderful libraries!